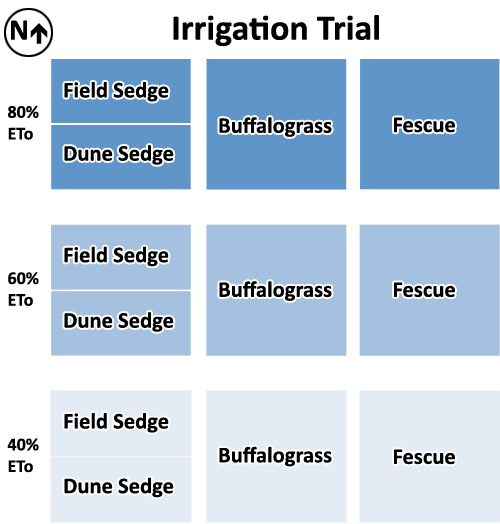 This trial consists of nine 12' x 12' plots, in which we are comparing 3 species, each under 3 different irrigation amounts. We will compare the number of mowings, clipping weights, and health and aesthetics of the turf. See links at the left for details about the 3 grass species. The goal is to see which species will still be healthy and look good even with as little as half the normal amount of water for lawns. Full, three-fourths, and half rate, based on reference evapotranspiration (ETo). Actual values will be 80%, 60%, and 40% ETo. ETo values can be found on the UC IPM web site--from the drop-down, select your County. In the photo on the left, sprinklers in full irrigation level are watering one plot each of all 3 species.